(SAN DIEGO, CA – February 4, 2019) On a day when people around the world raise awareness for cancer prevention, detection and treatment, the first-place San Diego Seals proudly announce their Stick Up For A Cure campaign to assist in putting an end to the disease. Centered around the Seals home game on Friday, April 12, the franchise will help dozens of local cancer-related organizations with fundraising, visibility and assistance for those they support. When the team takes on the defending NLL champion Saskatchewan Rush in April, players’ game jerseys will be the first of their kind in San Diego. Auctioned by cancer-related organizations this month with the charities keeping 100 percent of proceeds, the ribbon on the center-chest of each jersey will be colored to represent the type of cancer chosen by the auction winner. 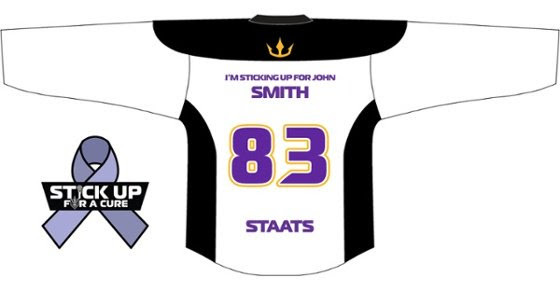 The back nameplate above each player’s number will feature the words “I’m Sticking Up For,” followed by the name chosen by the auction winner. Immediately following the game, the auction winner will receive the jersey from the player on the field during a special Jerseys Off Our Back celebration. In the weeks preceding the game, Seals players, Sirens dancers, Salty and the entire front office staff will create lasting memories with and make personal connections to patients, caregivers, survivors and oncology professionals. The team will individually announce when each jersey auction will take place. Join the San Diego Seals in their efforts on Friday, April 12 at 7:00pm PST at Pechanga Arena San Diego and help Stick Up For A Cure. Reserve seats for this special night at SealsLax.com.